The Spirit's Grave is the first dungeon in The Legend of Zelda: Oracle of Ages. It is located within a large mausoleum in Yoll Graveyard, a place which can only be accessed in the Present. The layout of the dungeon is similar in appearance to a gravestone. Interestingly, it is found approximately where the Ancient Tomb, the eighth dungeon, is located in the Past. The Spirit's Grave is a very basic dungeon, containing few enemies and some basic puzzles. As the name would suggest, the dungeon focuses mainly on the undead. It contains one room that can only be entered by burning a curtain using an Ember Seed. This room contains a Seed Ring. It has one, very simple side-scrolling area spanning only one screen and containing no enemies. This is where the dungeon's item, the Power Bracelet, can be obtained. 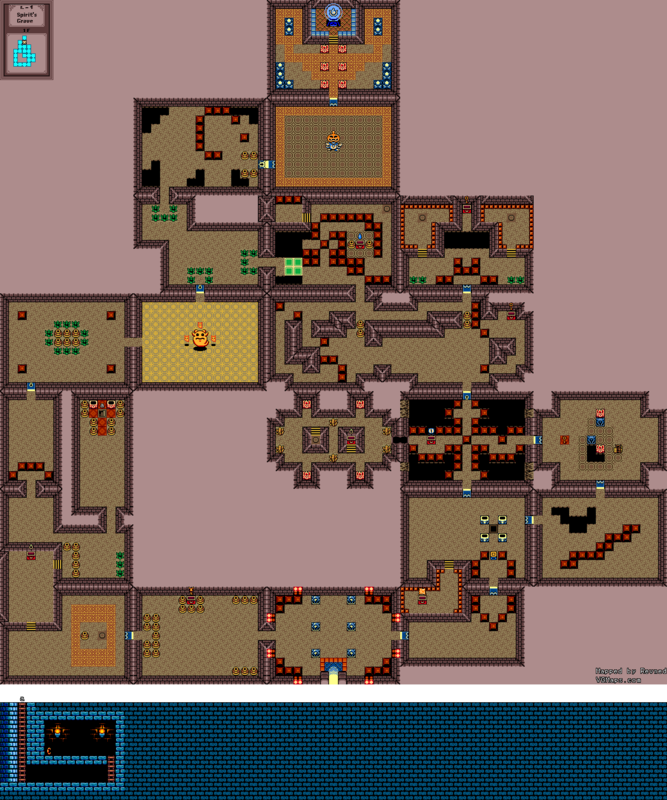 This room is identical to the side-scrolling area containing the dungeon item in the Gnarled Root Dungeon, the first dungeon in The Legend of Zelda: Oracle of Seasons. This dungeon also contains a discrepancy between the English and Japanese versions of the game. In the English version, there is a room just before Link finds the Boss Key that has an extra puzzle where Link must push a pot onto a switch to open a door. In the Japanese version, the room does not contain a puzzle, and the floor tiles are arranged differently.